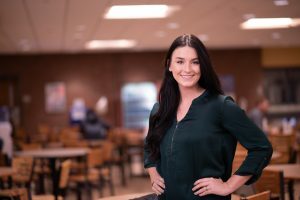 Accounting major Catherine Greene of Plaistow, NH attends Northern Essex full time, works 25 to 60 hours a week, and is training for a May marathon in Pittsburgh. Still, she finds time for fun. “Having a social life is important to me. I couldn’t balance it all without time management skills,” she said. A 2012 graduate of Timberlane High School, Greene squeezes studying in whenever she finds a minute. She has also never taken a day class, signing up for evening and online courses, which better fit her schedule. Whatever she is doing must be working, because she has an almost perfect 4.0 GPA, is a member of the Alpha Beta Gamma Business Honor Society, and is the recent recipient of the Moore Family Scholarship, which supports women returning to school. Greene wasn’t always a stellar student. She had a rocky year in high school and no one was more surprised than she when she was accepted to UMass Lowell. After three semesters of just barely getting by, she lost her financial aid, and ventured into the workforce. Greene’s aunt, Linda Larson, is the owner of Larson Tax Service, Inc in Newton, NH and, after Greene proved herself by excelling in an online bookkeeping course, Linda hired her as a member of the team in 2017. Her aunt became her mentor and her most passionate cheerleader, encouraging Greene to start back in college that fall. After earning her associate’s in accounting in May, Greene plans to continue, eventually earning a master’s in accounting and her CPA designation.